Regional powers Indonesia and Brazil are seen as potentially big borrowers as the governments try to raise money on the open market to buy arms, while Western firms rely on exports to survive a domestic downturn. 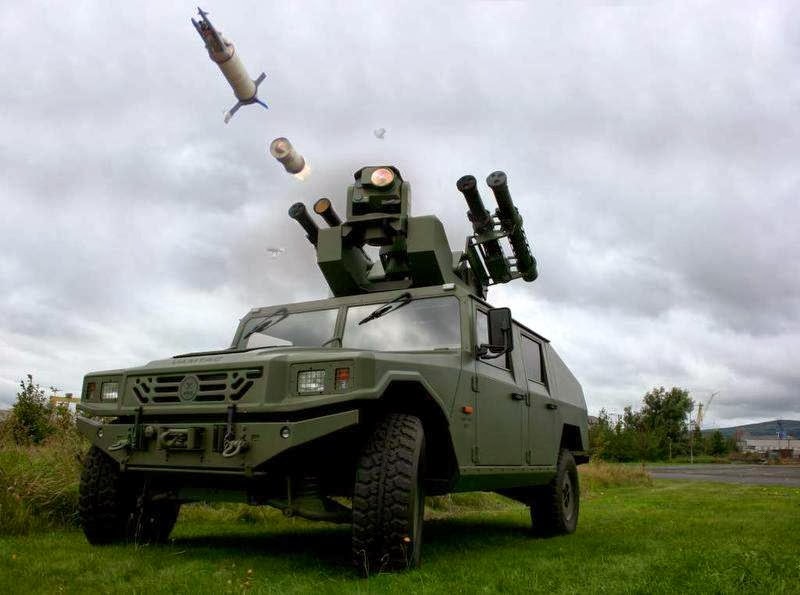 Indonesia’s Finance Ministry aims to raise an “international financial credit” to fund an order for a ForceSHIELD system of vehicle-mounted missiles and radars, to be built in Britain and France, the bank executive said. Commercial banks could receive a request for proposals in March or April, allowing the ministry to pick the most competitive loan terms to close a contract for the weapon system this year. The bank tender follows a loan raised last April to pay for Indonesia’s €108 million order for 34 Caesar 155mm/52-caliber guns from French land weapons makerNexter. Indonesia is also acquiring a new sailing ship to train Navy crews. Industry, meanwhile, sees access to cheap funding as important, as indicated by Airbus Group’s Feb. 14 announcement that it is buying a German private bank, Salzburg München, for an undisclosed amount. The planned Airbus Group Bank will allow the manufacturer to borrow money from the European Central Bank at a lower rate than the corporate bond market and lend to equipment suppliers in the manufacturing chain. Such an export deal is vital to Thales, which along with other French manufacturers looks for sales abroad to maintain production lines. Winning the Indonesian deal is a big boost for Thales, which needs to “relaunch” its air defense business as the company has struggled to sign up clients for its Crotale surface-to-air missile, the executive said. A prospect for Thales is a sale of the Crotale New Generation missile to Saudi Arabia worth €4 billion, website La Tribune reported. The latest borrowing allows four Indonesian Army batteries to be armed with the STARstreak missile, after negotiations closed last summer. Indonesia’s order for four missile batteries, announced in January, follows a deal for one battery agreed to with Thales in 2011. The one battery deal was on a contract in US dollars and funded by a German loan, the executive said. That contract has yet to go into effect. The German bank won that business on a private trade deal rather than an open tender, the executive said. The present tender aims to cover 80 percent of the total amount; is set also in dollars; and a request for information went out in 2013 to some 10 banks, both local and international. That 80 percent of the missile contract compares with 85 percent for the artillery loan, which saw the funds sent to the Indonesian Finance Ministry in April as requested. The British Treasury and French Finance Ministry will weigh the risk of bank lending as they effectively are guarantors for the loan insurance, a defense specialist said. Britain’s Export Credits Guarantee Department and Coface, backed by the French government, will examine Indonesia’s risk, particularly the level of national debt, the specialist said. The risk factor will be priced into the insurance, which will be reflected in the bank loan. Last year’s artillery loan carried a margin estimated to be just below 200 basis points for under five years, a relatively short period. Banks set the interest on loans using basis points — 1/100th of a percentage point — which are keyed to official interest rates such as the London Interbank Offered Rate. That artillery loan was considered relatively expensive, given the government sovereign guarantee that backed the borrow and the short loan term. The Indonesian economy is expected to pick up this year and next, after sliding in 2013 along with other emerging economies, said Petar Vujanovic, head of the Indonesia desk at the Organization for Economic Cooperation and Development (OECD), in Paris. “Indonesia will continue to grow, lower than the historic rate, but pretty well compared to other emerging markets,” he said. That growth, relying heavily on commodities exports to China, boosts the domestic budget and the means to repay bank loans. The OECD forecasts the gross domestic product will rise from 5.2 percent to 5.6 in 2014 and 5.7 in 2015. Under the missile deal, Thales’ British and French units will supply five batteries with short-range STARstreak missiles, CONTROLMaster200 radars and weapon coordination systems, lightweight multiple launchers, and RAPIDRanger weapon launchers. Another key Asian market is Vietnam, reflecting a rising tension with China in the South China Sea. Airbus Helicopter, French naval company DCNS and European missile-maker MBDA are looking to win contracts from Hanoi, the executive said. Italy is also looking to win deals with Vietnam. The Vietnamese Navy wants to buy Mica vertical launch surface-to-air missiles and Exocet MM40 Block III anti-ship weapons from MBDA to arm two Sigma corvettes from Dutch warship builder Damen, La Tribune reported. MBDA declined comment. Hanoi seeks to secure loans at a low rate, the executive said. Vietnam has bought Russian Kilo-class submarines and Airbus Defence and Space’s C-212 aircraft for maritime patrol and surveillance missions. Reflecting a toughening of bilateral relations, Vietnamese government-owned media for the first time recently carried stories of China’s 1974 seizure of the Paracel islands in the South China Sea, in which dozens of soldiers of the then-South Vietnamese Army lost their lives, BBC reported.